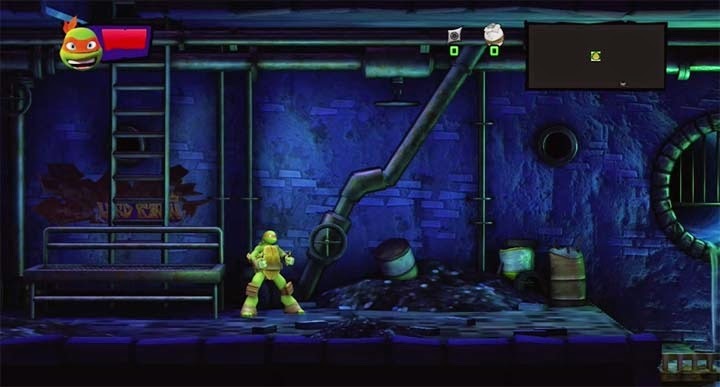 It starts with such a great homage to the original NES TMNT. 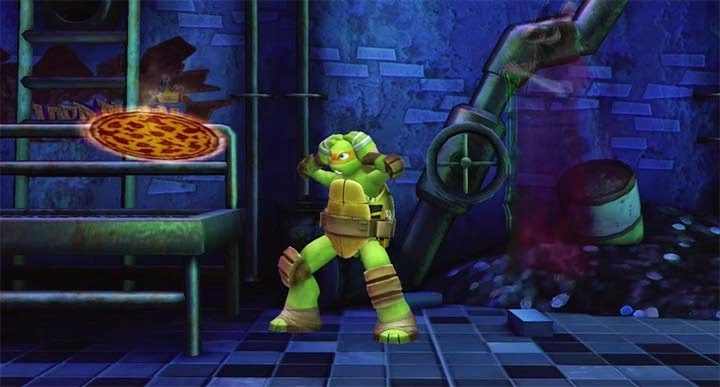 It's been years since we've had a truly great Teenage Mutant Ninja Turtles game. The last one that made a lasting impact that I recall, and still play today, was TMNT the beat-em-up based on the 2007 movie with the same title on the Game Boy Advance (GBA). Recently we've gotten TMNT: Out of the Shadows, Teenage Mutant Ninja Turtles the Nickelodeon based show game, and the Michael Bay movie tie-in Teenage Mutant Ninja Turtles game for the Nintendo 3DS. None of them were noteworthy in any way, and they were all pretty terrible. 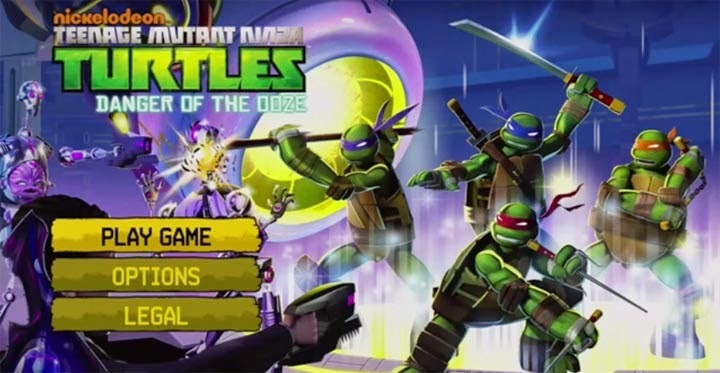 The only decent one is the Bay TMNT tie-in on iOS and Android mobile devices. Honestly, even these two Nickelodeon web-based games are better than the lot that we've gotten- Donnie Saves a Princess and Ninja Turtle Tactics. To me it seemed to be games to keep a licensed franchise going for the sake of it and nothing else. Sadly even WayForward Games couldn't live up to their name in making Danger of the Ooze. Wayforward has a history of really good 2D platforming action games such as the Ducktales: Remastered, the Shantae series, and Thor: God of Thunder for the DS. I'll actually also mention all their Spongebob Squarepants games as well, because they are all quite good, at least the GBA ones. So when I heard Activision was partnering with WayForward I was excited. Then when I heard the game was going to be a "metroidvania" game I was a bit skeptical, but still held hope. Looking for pizza, late for training! The story is nestled between season 2 and 3, and the Shredder has somehow gotten hold of Super Mutagen. That is as much as you would need to know about the story, and it gains no extra depth by the end. This whole plot could've been squashed into a 22 minute episode, but they've managed to stretch it into 4 or 5 hours of tedium. Even the other characters like Casey Jones, April O'Neil, and Slash appear to serve as nothing more than cameos to bestow a new ability upon you seem like a contractually forced obligation. It lacks everything that makes the Nickelodeon show so great. There isn't any heart or soul behind it. Taking the metroidvania style of 2D exploration, one might think this to be an interesting take on the TMNT. With the metroidvania style of unlocking new skills that allow you to progress into new areas of the map over the course of the game. Unfortunately, this type of game is severely hindered by poor hit detection, boring combat and enemies, and platforming that always feels just out of reach. Every bit f backtracking felt like a huge chore instead of something to look forward to. Having to destroy the same 3 enemies ad nauseam becomes a genuinely good reason to stop playing a game and I really wonder how many kids will make it to the halfway point of the game because of it. On the flip side of this, with each new skill, such as shuriken tossing, double jumping, or a dash, makes the combat slightly less cumbersome. Near the 60% mark I decided it was much swifter and easier just to run and bypass all the enemies possible. It saved a lot of annoyance during the running back and forth time. The only good thing is the fact you may choose any of the 4 turtles at will and swap them in or out as you please. One problem with this is all 4 play nearly identical and offer no real difference other than choosing who you want to waste a life bar with on a boss fight. When I think about it, this game appears to have been aimed at kids, but the difficulty level seems much too high for them at times- notably the final boss fight. Fighting the Shredder was challenging mainly because it takes a different form than anything else in the game. You can only damage him indirectly when an extremely short prompt shows up once in a great while. I had a 4 minute period where he just kept attacking and when the prompt finally came, he wasn't near only thing that could damage him, making me wait through the cycles again. No explanation is given, there are no hints, nothing. I actually feel bad for any kids that manage to make it here because it's preposterously hard compared to the rest of the game. What the game does right is a couple things. Right away when you go to enter a name, Michelangelo steps up and gives you a random one. A small, but nice touch. Another thing I noticed was if you enter somewhere with a boss and the turtles speak, each turtle has different lines. That is also nice, but it won't make me want to play any more than I have. The animations are only OK, and the cutscenes have awful lip syncing issues. The game was definitely a trap. Having said that, some of negative aspects of the game could've been overlooked had WayForward added more fan service and a lot more from the source material, but there wasn't. While I applaud the fact WayForward took a chance in making a new type of TMNT game, it seems to empty. Danger of the Ooze is not nearly the worst Turtles game around, but it isn't even remotely close to the best either. I still look forward to a time when we get a game that takes the TMNT universe and gives us something 4 player, fun, and memorable. As it is Danger of the Ooze is an empty shell and it feels like a simple cash grab. Maybe if it was $15 instead of $40 it might not have felt like such a poor decision to buy.